There are plenty of river cruises in Europe but one that gets overlooked is the river cruise along The Seine. 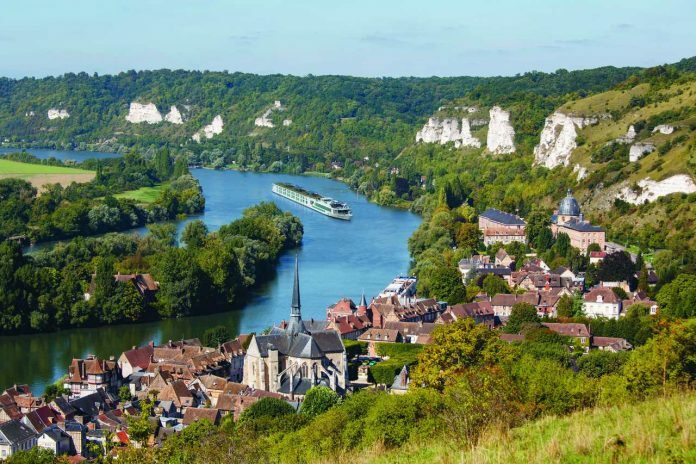 And that’s a shame because these waterways pass all the way from Paris through rural Normandy and the Channel taking in chateaux, city scenes, gardens and grand riverside cliffs. Perhaps one of the best ships to enjoy this route is the Scenic Gem – a ship dedicated to sailing the Seine. What is the Scenic Gem like? Scenic Gem is one of Scenic’s elegant “Space-Ships”, named so for their contemporary design and, well, space. She was built especially for the narrow, curving Seine – shorter than most river ships and carrying a maximum of 128 guests over 64 suites with a crew of 44 looking after them. Almost all rooms have balconies, glass ones with glass walls that fold back to open up the whole room as a conservatory. 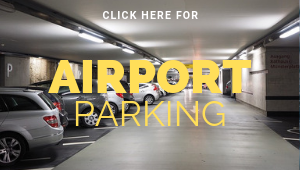 Service is all-inclusive, from the drinks to the fleet of ebikes on which you can explore to free tours at each stop. The Panorama – a combination bar, dance floor – acts as a casual lunch venue and lounge and is at the heart of things with magnificent views. The main restaurant, Crystal Dining, is sleek and white with splendid meals while things only get more sophisticated in little L’Amour. On offer is a five-course menu of Normandy specialities, such as duck in cider, paired with regional wines. The cruise starts from the lively, cosmopolitan Paris riverbank, full of artists, musicians and lovers, in the middle. The Eiffel Tower pokes its head above the buildings and it’s barely a 10-minute stroll along the water’s edge (and there’s plenty of time to explore before the evening departure). After dinner stand on deck sipping a calvados and watch the light show that nightly illuminates tower, then glide away into the dark. 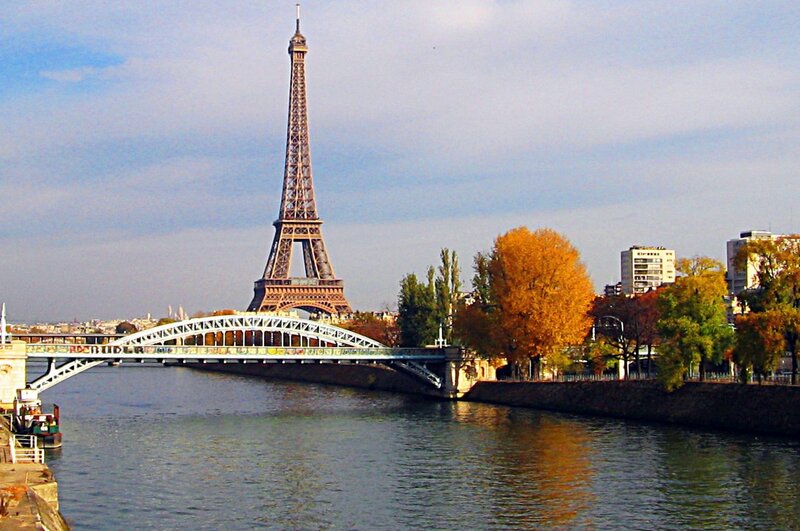 Download Paris Monument Tracker and explore the monuments along the Seine. 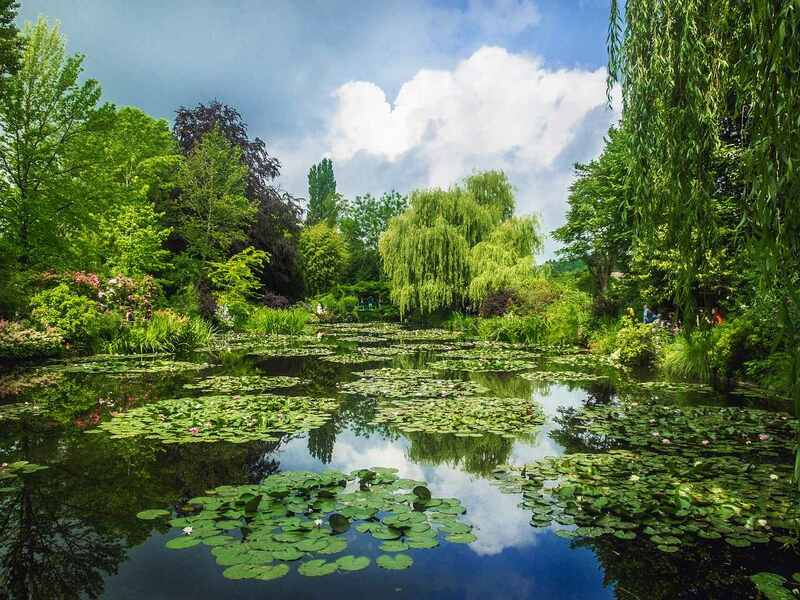 Vernon is home to one of the Seine’s most famous attractions – Giverny, the home of Impressionist master Claude Monet. The Japanese-themed garden, with house-high bamboo and a stream emptying into the Seine, has as its centre point a lake with a charming green-painted bridge and a wealth of water lilies that he painted again and again. Wander the gardens (clever planting makes them fascinating at any time of year) and the pastel-painted cottage. Hop on the free bus to the gardens – or do it yourself on ebike. 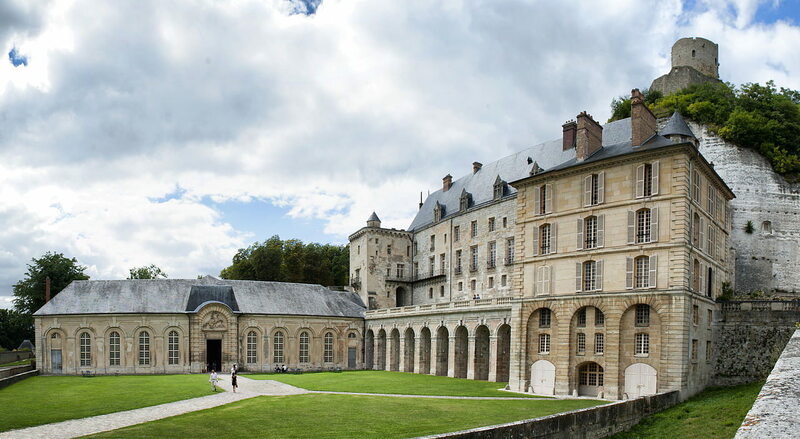 In La Roche-Guyon 14th-century Chateau de La Roche-Guyon sits between river and a chalk cliff. An included Scenic Enrich cultural treat involves drinks in the imposing, echoing stone stables before a glorious recital by a classical quartet It’s a European greatest hits – Vivaldi’s Four Seasons, Mozart’s A Little Night Music, Grieg’s Peer Gynt – in a delectable room, all painted ceiling and stone floor. Less esoteric is the nightly music on board – we had a hits-playing guitar duo, followed by recorded disco dance floor favourites. 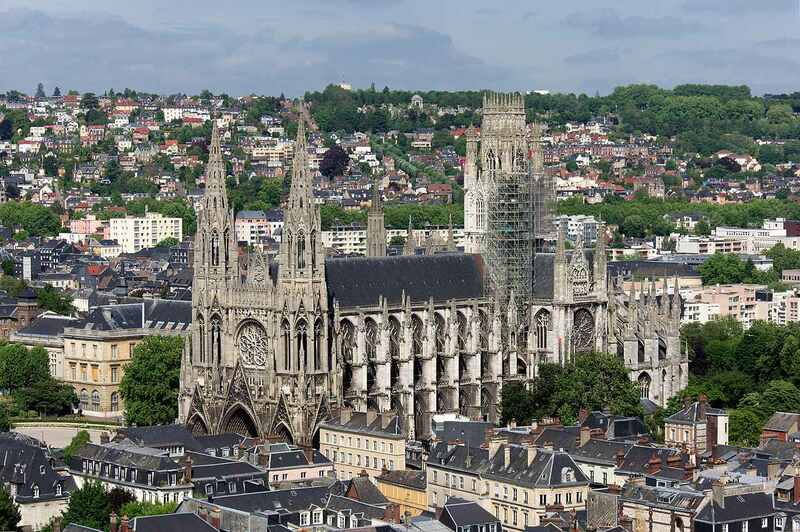 As Scenic Gem approaches the city of Rouen, the slim, cast-iron spire of the grandiose Gothic cathedral looms up – this was reckoned the world’s tallest building for a short time in the late 19th century. It was a favourite Monet subject and contains Richard the Lionheart’s tomb (his hilltop fortress, Château Gaillard, is back towards Vernon). The city also features the spot where Joan of Arc was burnt at the stake along with a modernist church in her honour and a museum. 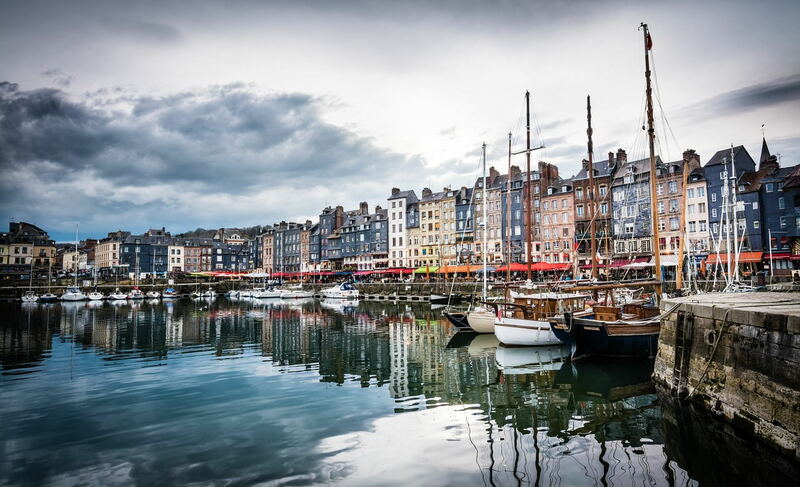 Honfleur is wonderful medieval port that sits on the Seine estuary as it pours out into the sea (across from the seaside resort of Le Havre). And the Scenic Gem is one of the few ships that can enter this port. You dock on the Seine but walk through the backstreets gets you to the yacht-filled Vieux Bassin, lined with ornate buildings, restaurants spilling out on to the stone quaysides where market stalls offer local delicacies and souvenirs (take home a bottle of cider vinegar if nothing else). St Catherine’s church is a wonder, France’s largest timber church, built by boat makers in the shape of twin upturned hulls. 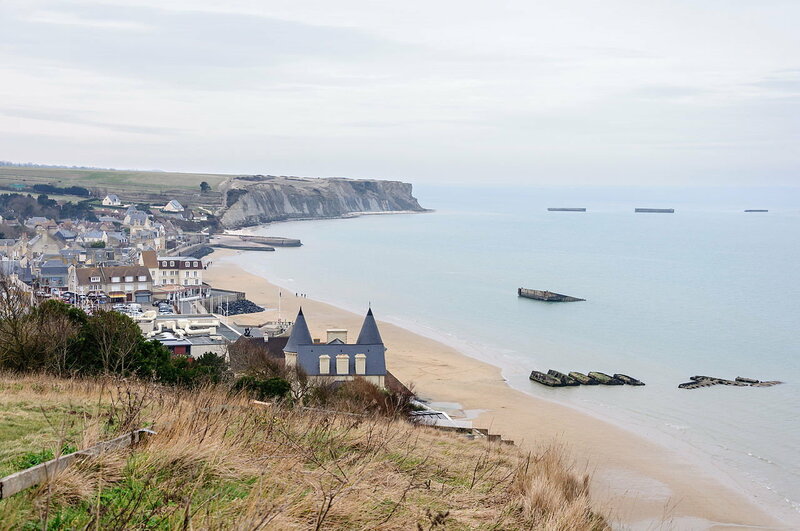 The D Day beaches are an included Scenic Freechoice tour. At Arromanches, where the Allies installed the temporary harbour that was towed in pieces across the Channel, is the D Day Museum, followed by an included lunch (with decent local wine) at a lovely stone farmhouse-turned-restaurant then a stop at Omaha Beach, a windswept stretch where huge American forces landed on June 6, 1944. Then the American Cemetery, a moving place where the graves of 9,385 US military who lost their lives in or following D Day sweep across manicured lawns, a sea of simple white crosses, on a bluff overlooking the sea. 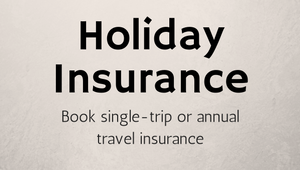 There is also the option to visit the British and Canadian cemeteries.